Gain G = G1 x G2 x G3 etc. Total gain in dBs = dB1 + dB2 + dB3 etc. When coupling amplifier stages together impedance matching is important so that as much signal as possible is transferred from the output of one stage to the input of the next, keeping inter stage losses to a minimum. Ensuring that the correct bandwidth is maintained throughout all stages of amplification. It may be required that where the output of one stage is at a different DC potential to the input of the next, the two stages are electrically isolated from each other. In some amplifiers, it is important that DC, as well as AC is coupled between stages. In direct coupling, illustrated in Fig. 2.5.1, the output of one stage (e.g. the collector) is connected directly, or via a component such as a resistor, which does not block DC, to the input (e.g. the base) of the next stage. This method allows the amplification of very low frequencies as well as DC (0Hz). DC coupling may also be used in wideband amplifiers to eliminate the use of capacitors where there may be a possibility of high frequency instability caused by capacitors and resistors combining to form filter or phase shift circuits; if this happens the gain may have variations at some frequencies due to filter action and may become unstable and begin to oscillate if unwanted phase shifts occur. Amplifiers using direct coupling must be very stable in their operation, especially with regard to variations in temperature, as even a very small change in the bias conditions at the base of a transistor caused by fluctuating temperature, will cause a large change in the DC conditions at the collector, creating an error voltage (the difference between the predicted collector voltage and the actual voltage present). Any such error will be magnified at each subsequent stage, and so efficient bias stabilisation is vital, also some additional error correcting feedback is normally required. Capacitor coupling (Fig. 2.5.2) provides electrical isolation (DC Blocking) between the coupled stages, whilst allowing AC signals to pass. This allows for different collector and base voltages on the coupled stages, and reduces DC stability problems. 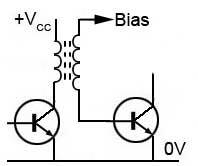 With this type of coupling, the reactance of the capacitor must be low enough at the lowest signal frequencies so as not to unduly reduce signal between stages. However, using capacitors in this way can introduce unwanted high and low pass filter effects, as described in DC Coupling above. In transformer coupling (Fig. 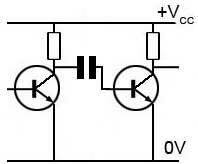 2.5.3), the signal current flowing in the collector circuit of one stage flows through the primary winding of a transformer, which induces a signal voltage into a secondary winding connected in the input of the next stage. This signal is added to the DC bias at the base of the next stage. Only AC signals are coupled, DC is blocked and the transformer turns ratios can also be used to provide impedance matching between stages. Transformer coupling is more ideally suited to radio frequency (RF) amplifiers because the size of transformers at these frequencies can be kept reasonably small. The much larger audio transformers are used for matching power output amplifiers to loudspeakers and microphones to amplifier inputs, but even so, tend to be too large and heavy for applications such as inter-stage coupling between multiple stages.